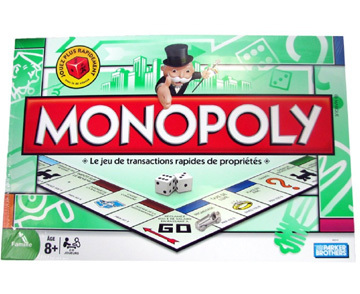 A large selection of Monopoly Games based on locations other than Atlantic City is shown below.. Links are provided to Amazon.com where you can find out more about the games, and if you like, purchase them. 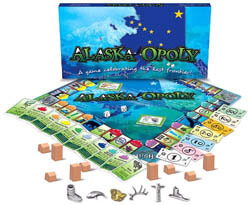 Monopoly Alaska Edition "The Great Land"
"Advance to GO! The Monopoly Brand introduces the Alaska Edition showcasing "The Great Land." With more land in national parks, wilderness areas and national wildlife refuges than all other states combined, Alaska's magnificent real estate and natural assets hold a magical allure. Now you can buy, sell and trade the state's foremost properties in this unique edition of the world's most consummate real estate game." The classic property trading game you all have come to know and love only this time with an Alaska theme. Great for young children to adults as you learn your way around in space. 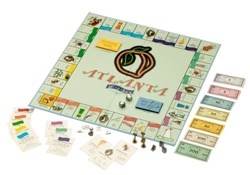 TThough it looks like a traditional game of Monopoly, this board game is played in celebration of the city of Atlanta. Two to six players compete to buy property and improve it, eventually adding keys to the city that raise the property's rent. Players who become bankrupt leave the game. The winner is the one player left after everyone else loses their shirt. All properties are familiar Atlanta landmarks, like the King Center and Centennial Park. Big Fun cards add a random element to the game as players find themselves caught in Kudzu or winning the Peachtree Road Race. Those with a love for Atlanta will enjoy the detailed references to local customs and culture. Ever felt the urge to own Camden Yards? How about the Washington Monument? 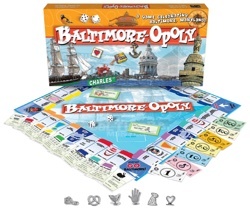 Residents and fans of Baltimore will delight in all the ownership opportunities offered in this Late for the Sky game inspired by Hasbro's classic, Monopoly. Baltimore landmarks make up the board's real estate. This Monopoly game was designed for and by Boston natives. It's got all the landmarks that make Bean Town such a special city--Beacon Hill, Fenway Park, the USS Constitution, Old North Church, Copley Place, the Union Oyster House, and more! 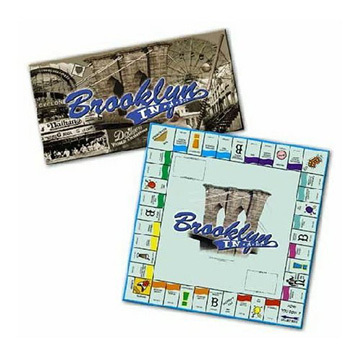 This Brooklyn Monopoly game would be a great gift when visiting expatriots who grew up in Brooklyn and still have Brooklyn in their soul. If they still haven't forgiven the Dodgers for leaving NY, then these are the people who will enjoy this version of the game. Brooklyn is an attitude, a way of life, a borough, a city - some even say a country! 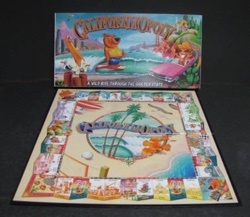 Welcome to CaliforniaOpoly, a beautiful and creative board game that captures the character and diversity of the Golden State Sun-drenched surfers, glamorous movie stars, high-tech gurus and, of course, earthquakes are all part of the fun. From the peaks of the Mount Whitney to the depths of Death Valley, players get a taste of everything California has to offer. Stake your clain in Gold Country, search for stardom in Hollywood, and rattle your bones in Earthquake Zone as you strive to monopolize and become the wealthiest Californian Alive! 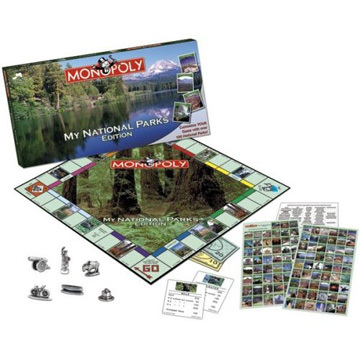 Monopoly board game based on locations and features of Canada. The Game Includes: Tokens CN Tower, Ski Boot, Beaver, Canada Goose, Maple Leaf, and a Hockey Stick. Board Spaces include: Niagara Falls, Lake Winnipeg, Magnetic Hill, Canada Museum of Nature Chateau Frontenac and more. 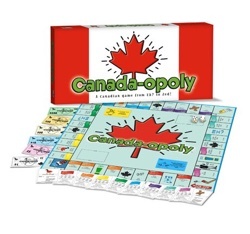 Canada-opoly: A Canadian Game from EH to ZED! THIS IS A CANADIAN GAME FROM EH? TO ZED! Ever imagine owning CN Tower? Or maybe Niagara Falls? Here is your chance. 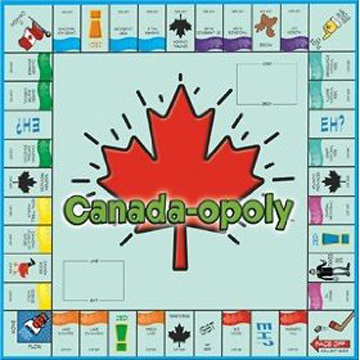 Canada-opoly is a property trading game designed just for hockey loving, maple syrup chugging, board game adoring Canadians. Buy your favorite Canadian properties then collect Log Cabins and trade them in for Ski Chalets. Sounds easy enough but add a snow storm, GST, too much figgy duff and an angry moose and it becomes a little more difficult, and a lot more fun! 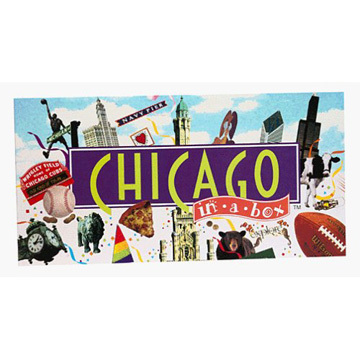 Try this Chicago-themed board game: it has everything from the Sears Tower to Wrigley Field on a familiar-looking square game board, with "Contingency" and "Big Fun" cards to keep you guessing as you zip around the city, fighting the wind and buying properties, building houses, and collecting rent from your opponents. It's the perfect gift for Chicago-lovers around the world! How do you make a game about the second city? While it?s impossible to include everything, we jammed all the Chicago we could into this box. It?s full of blues, pizza, sports, a little more pizza and lots of wind. Looking for a fun way to experience the windy city? Here it is. Monopoly City is the Monopoly game that lets you build in an instant and create the perfect city. Build on every Go and watch your city fortune grow! 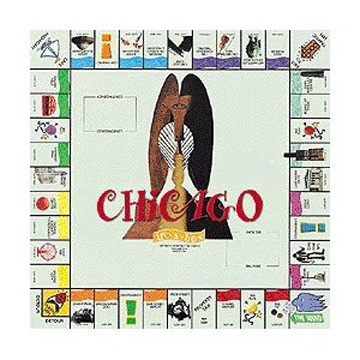 In this metropolitan edition of MONOPOLY, be the top property developer and watch your dream city rise before your eyes. What will you build-- houses or industrial complexes, schools, skyscrapers or stadiums? The choice is yours. But watch outa rival developer could build a sewage plant right next to your prize property and make its value plummet! So build wisely and rake in the rent... and the prestigious MONOPOLY tower could be yours! 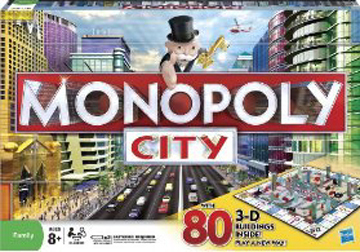 Features 80 3-D buildings so you can develop your MONOPOLY property. 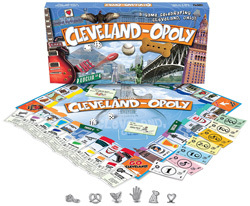 Anyone whose heart belongs to the city of Cleveland, Ohio, will appreciate this Monopoly-inspired game from Late for the Sky. All locations and properties are specific to Cleveland, and include local landmarks from the zoo to favorite sweet shops. You start at the Rock (for the Rock and Roll Hall of Fame) and if you land on Lake Erie, you get all the money in the center of the board. Rather than going to game-board jail for infractions such as landing on the wrong corner space, you get stuck in a big traffic jam till you roll doubles. 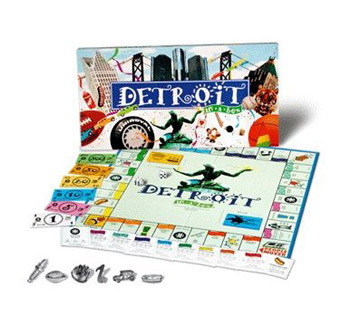 Detroit in-a-box was created with the help of Detroit natives. We asked Detroiters what makes this city so great. While its impossible to include everything, Detroit in-a-box hits the highlights. The game is full of cars, fireworks, Jazz, and coneys. This is a game about Motown! 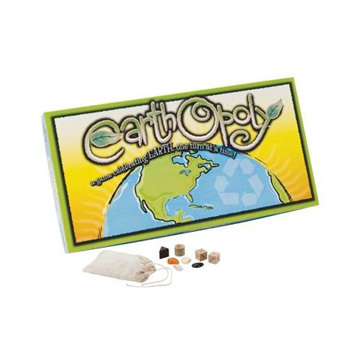 Earthopoly is a game celebrating Earth, one turn at a time! Players become the caretakers of wondrous locations around the planet then increase their property value by collecting Carbon Credits and trading them in for Clean Air. It's all fun and games until someone gets sent to the Dump! One of the world's most popular board games is now in French! Your students will practice a whole host of vocabulary as they make their way around the board and pass GO. But don't worry, $200 isn't all they'll be collecting as they play this complex game; they'll gain the confidence they need to use their French in a variety of everyday situations! 2-6 players. 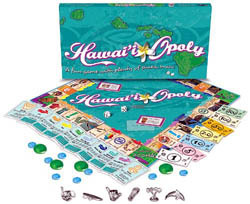 The classic property trading game you all have come to know and love, only this time with a Hawaii theme. The votes are in. 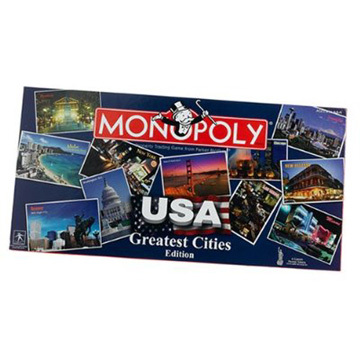 People voted on their favorite cities in the U.S., and now you and your family can race around the board visiting them in the Monopoly Here and Now game. Players strive to buy their favorite cities before their opponents. Upon buying a city, players collect passport stamps and the first player to fill their passport wins! 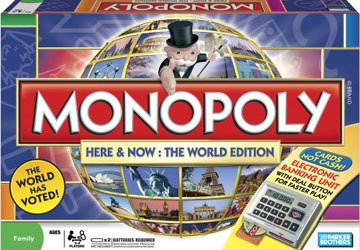 With quick and fun gameplay, the Monopoly Here and Now game can be played in approximately 30 minutes. 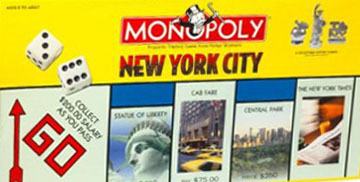 The Here & Now: The World Edition Monopoly Game is based on the cities from across the globe including New York, London, Shanghai and Istanbul. Also the money is adjusted for inflation. Be prepared to pay from $100k to $5 million for properties around the world! 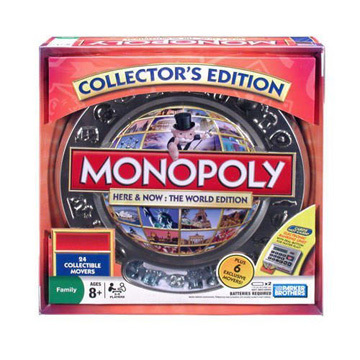 The global version of the Monopoly board game based on cities around the world - Collectors Tin Edition. The world's number one game has gone global! 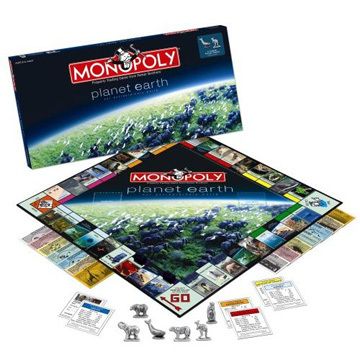 This world-class Monopoly gameboard has you traveling to cities across the glove Get ready to wheel and deal with your own Monopoly credit card and use a digital banking device that keeps track of your balance. You'll cross six continents before you pass GO! 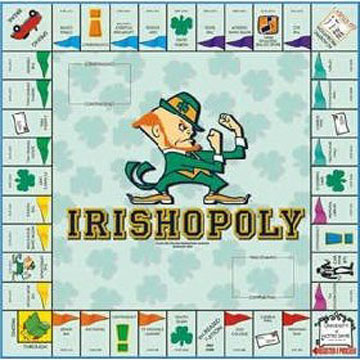 The IRISHOPOLY board game is perfect for Notre Dame Alumni, students and future grads. Tokens include fighting Irishman, football, shamrock, alarm clock, and bicycle. Board spaces include the golden dome, Notre Dame stadium, law school, fighting Irish band, the huddle, St. Michael's laundry, and St. Joseph's lake. 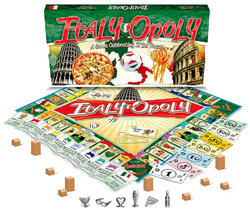 The Classic property trading game you all have come to know and love, only this time with an Italy theme. HOW YOU DOIN'? Play a game that celebrates one unique place! Collect Jersey highlights and increase the rent by adding Small Towns and trading them in for Big Cities. It's all fun and games until you're sent to Traffic Jam and you're out of the game for three turns! PLAY TO RULE THE GARDEN STATE! Who knows! You may soon be going "down da shore," or chasing the Jersey Devil! So choose your token and advance to "How You Doin'." Whatever happens, it's gonna be Jersey all the way baby! FOR 2-6 PLAYERS AGES 8 AND UP. Want to own Harrah's or the MGM Grand on the Las Vegas Strip, or even the Hoover Dam? Now is your chance. 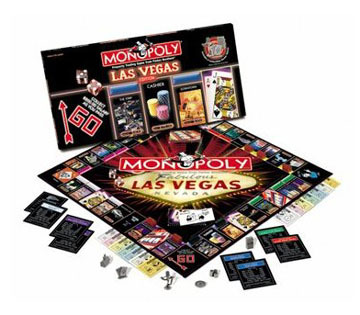 The safest waqy to spend money in Las Vegas is by playing the all-new Las Vegas Edition of the Monopoly game. Play for the ultimate fantasy of Vegas-style success and wealth. Everybody loves the timeless game of Monopoly. Now you can travel around all the most famous stations on the London Underground as you race to the top! Cities, towns, counties and now, even football clubs are celebrated through these special editions of this classic family game. Featuring many of the region's most famous landmarks and cultural icons, they make wonderful gifts, souvenirs of a trip, or great family fun with a local flavour. This product is officially made by Winning Moves under license from the Copyright holder. Here is a game celebrating the great state of Texas. If you arelucky enough to live here, you know it is a whole nother country! 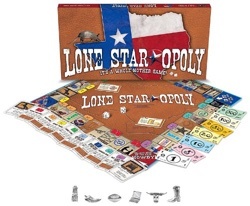 Lone Star-opoly is your standard property trading game with some Texan twists. Collect your favorite places and raise the rent by buying Small Towns and trading them in for Big Cities. It is all fun and games until someone ends up in "Not From These Parts" and is booted out of the game for three turns. Flip the deeds over and read fun facts about each of your properties. So gather family and friends and advance to Howdy. Who knows! You may soon be competing in a Chili Cook-off... or wheeling and dealing in the big city!. For 2 - 6 players. Ages 8 and up. 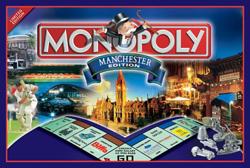 Monopoly, the great property trading board game finds it's home in the heart of the North West, UK, You can now play the classic money-making, chance-taking, budget blowing game with the street names, landmarks and locations which give this city it's distinctive character. Manchester is the liveliest of the cities with it's exciting cosmopolitan atmosphere, galleries, theatres, Victorian architecture and sports clubs, Manchester is everyone's kind of city. 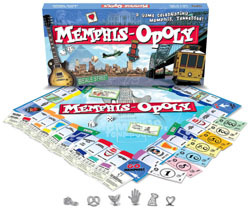 The Classic property trading game you all have come to know and love, only this time with a Memphis theme. 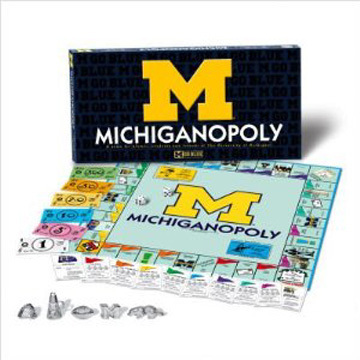 A game for alumi, students and friends of The University of Michigan. GO BLUE! Hail! Hail! To Michigan, the champions of the West! There's nothing like the college experience and nowhere is it better than the University of Michigan. Located in the consummate college town of Ann Arbor, the University of Michigan combines academic excellence, the nation's premiere athletic conference, and an enthusiastic, to say the least, student population into memories that last a lifetime. Experience America Your Way. 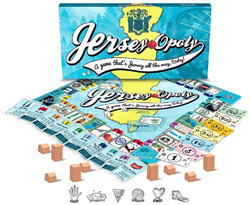 The world's best selling board game brings you the opportunity to capture national treasures from sea to shining sea. 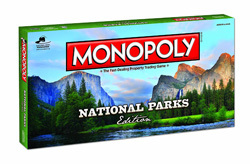 The My National Parks Edition of the MONOPOLY game allows you to customize your own game with over 100 of the most beautiful Parks from across America. Take a bite out of the Big Apple with the all-new MONOPOLY Game: New York City Edition! Delve into risk taking and deal making in a quest to buy up New York City properties from Manhattan to Central Park, the five boroughs to Wall Street and Fifth Avenue. 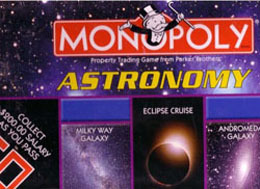 The MONOPOLY: Night Sky Edition brings the wonders of the universe right into your living room. 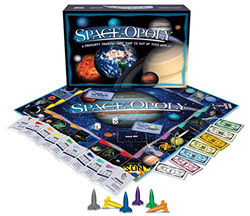 Move around the game board as you purchase comets, planets, star clusters, nebulae and galaxies and build observatories. Steeped in a history of shoe-making and the leather industry, Northampton is now a base for some the world's biggest industrial brands which has made it a focal point for business in Britain, as well as offering a rich social and cultural side of life. 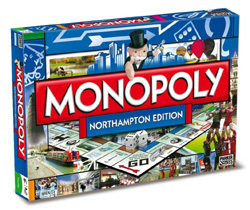 Now you can tour Northampton and all its famous and popular locations with this new edition of Monopoly! From Abingdon Park to Sixfields Stadium, and from Althorp House to the Guild Hall, it's all up for grabs as you race around the board building a property empire to beat your opponents! Late for the Sky is best known for their college games--Monopoly-inspired games set in universities instead of Atlantic City--but this time 'round the company has turned its attention to immortalizing Philadelphia, Pennsylvania. Players move tokens around the board, acquiring properties and amassing wealth, until the last mogul to avoid bankruptcy is declared the winner. 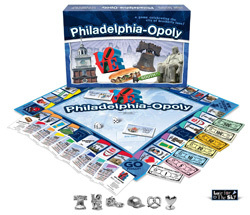 In this Philadelphia-inspired board game, the tokens are regional (a miniature Liberty Bell, among others), and the properties are some of Philly's most beloved landmarks--Penn's Landing, Independence Hall, and the Betsy Ross House. Buy, sell and trade 22 of the earth's most spectacular landmarks, environments and animals as featured on the Planet Earth television series on the Discovery Channel. This edition contains stunning photography as-well-as extremely rare photographs of the earth's natural habitats and animals from the award-winning series! Plymouth is a vibrant waterfront city packed full of attractions. Come rain or shine you'll find something for everyone among the city streets, surrounding countryside and marine environment beyond. 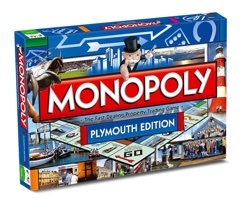 Monopoly has captured the magic of this region in this unique Plymouth Edition. 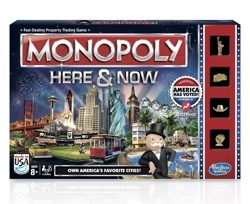 This board game featuring San Francisco is similar to Monopoly, but features an abundance of cultural information about the historic city by the bay. Beginning with the same amount of cash, the two to six players move around the board buying and developing property, charging rent and losing or gaining money depending on where they land. Landing on Big Fun and Contingency squares gives players a chance to pick a card that may help or hinder their progress. The game winner is the last player left who isn't bankrupt. Familiar San Francisco themes and places include cable cars, Alcatraz, Coit Tower, and the 49ers. The City In-A-Box game series brings local flavor to a familiar board-game concept. In-A-Box games are based on building an empire by buying and developing property, and reaping the benefits of landownership. There are also the requisite pitfalls and chance occurrences that life can, and will, throw your way. The object is to be the last financially solvent player left in the game. 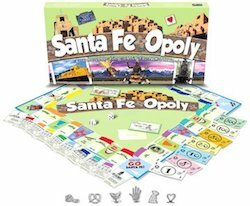 The Classic property trading game you all have come to know and love, only this time with a Santa Fe theme. Sculpted playing tokens. -For 2 - 6 players.-For ages 8 to adult. Get lost in space. Collect your favorite cosmic wonders and play to rule the universe. Watch out for the black hole or you won't be home in time for dinner. Play the world's most popular game using rules in the Spanish Language. 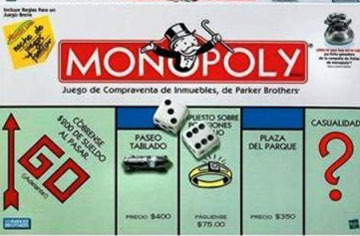 Monopoly Spanish Edition is a great way to practice your language skills, and it makes the perfect gift for a Spanish-speaking friend! Buy real estate, collect rents and buy hotels - but don't go broke! 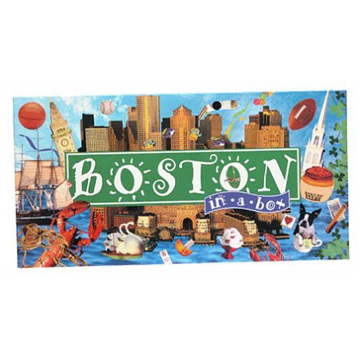 The Big Apple, the City of Angels, the Golden Gate City, Beantown; America's favorite board game brings you the chance of a lifetime. Now you can buy, sell, and trade the USA's greatest cities from coast to coast. Celebrate life, liberty, the pursuit of happiness and capitalism as you wheel and deal San Diego, Honolulu, Miami and more. 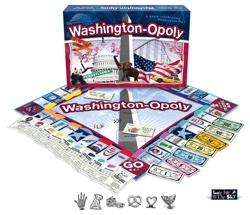 Our nation's capital sees a lot of wheeling and dealing, but this Washington, D.C.-themed board game lets you buy it all up and try to make a profit! Based on another, very popular property-buying game, the familiar square board and metal tokens are all here, but you'll be picking up choice spots like the Smithsonian, the National Zoo, or even the White House in your bid for glory. 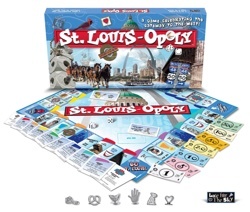 Whether you live or work in D.C., or just love the idea of owning a big chunk of the most powerful city on earth, you'll find this a fun, fast-paced, and charming game.